Kryptonian Warrior: Muppet Movie To Get A Sequel... Without Jason Segel? Muppet Movie To Get A Sequel... Without Jason Segel? It was reported last week that Disney has come to a deal with The Muppets director James Bobin and the film's co-writer Nicholas Stoller to get to work on a sequel. 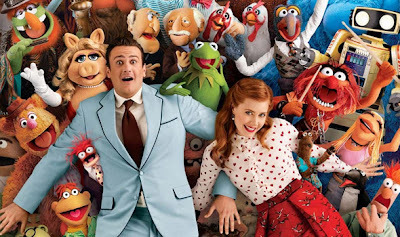 Unfortunately, How I Met Your Mother's Jason Segel's hectic schedule (as well as working on the CBS sitcom, he's also busy writing other films as well as starring in the likes of Five Year Engagement and This Is Forty) means he simply won't have time to work on the sequel. However, the site reveals that their Disney insiders have confirmed that he may still star in the movie depending on the direction of the Stoller/Bobin script. The whole Kryptonian Warrior household went to see The Muppets recently and although we all enjoyed it we all felt (even the kids) that there was something missing... Hopefully that'll be rectified, whatever it is, by the sequel!